The Kai-Zen strategy allows your clients to maintain their current lifestyles in the event of a chronic illness, premature death, or if their retirement savings prove to be insufficient. Protecting their earnings is critical to insuring their ability to save for retirement. Due to limitations, traditional retirement plans are typically insufficient for high-income earners. If your clients want to maintain their lifestyle in retirement, you must provide them a proactive strategy that puts more money toward protecting their future income without putting a drain on their current finances. By using bank financing, the Kai-Zen strategy allows your clients to reap incredible benefits while staying within their contributory means. Much like the process of using a bank mortgage to leverage assets to purchase a home; money is borrowed to buy more house (or with Kai-Zen, more benefits) than one could purchase with assets on hand. The amount funded into the policy has the potential for market growth without the risk of market losses due to declines in an index and uses the policy’s cash value as the sole collateral for the loan. Are your clients concerned they aren’t saving enough money for retirement? The Kai-Zen strategy provides them a superior and smarter way to fund the retirement they’ve dreamed of. 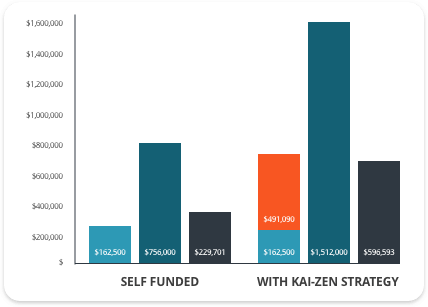 Kai-Zen utilizes financing as a way to supplement the funding your clients have available to buy more of the benefits they need. The ultimate result is a higher level of financial comfort than could be found with savings and traditional life insurance alone. *Net of loan repayment, riders are supplemental vbenefits that can be added to a life insurance policy and are not suoitable unless there is a need for life insurance. **Policy loans and withdrawals reduce the cash value and death benefit and may result in a taxable event if the policy is surendered or lapses. With Kai-Zen, your clients can leverage to obtain more benefits today and potential cash accumulation for their retirement future. The decision to use leverage is driven by the idea that the money contributed will grow at a higher rate of return than the cost of borrowing and, at the very least, one would be able to enjoy the benefits of these purchases immediately. Key employees are the lifeblood of any company and it is always crucial to be more attractive than the competition. Benefits are necessary to recruit and retain the best employees, but most companies offer essentially the same benefits as everyone else. How does one offer more to set themselves apart from the competition? Kai-Zen is a unique strategy that allows a company to achieve a competitive advantage by offering the best benefits, provide more protection, and potentially save more for its employees’ retirement. Simply put, the Kai-Zen strategy provides the extra funding to set any company apart without having to increase their budget. The real reason businesses are not offering additional benefits to their key employees is cost. The Kai-Zen Strategy uses leverage to help cover the costs of the additional benefits needed to attract top talent. A unique feature of Kai-Zen is that there are no loan qualifications or loan documents signed by the employer or employee. The contributions made to the strategy act to fully secure the loan. 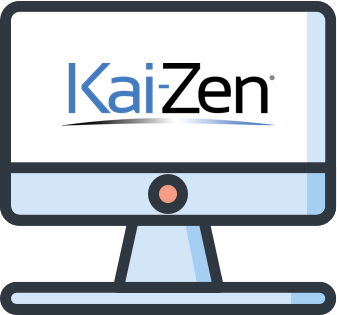 Utilizing Kai-Zen allows companies to spend less on something that would otherwise be a substantial expense. This will ultimately improve their cash flow and decrease costs while offering the differentiation needed to compete for the best employees. In addition, due to the high cost of benefits, businesses also find it difficult to provide adequate coverage for other business liabilities such as Key Person, Buy-Sell Agreements, Succession Planning, etc. These events can typically be funded at half the cost of traditional options with Kai-Zen. Key executives leave for a variety of reasons which can leave a business scrambling to cover their loss. They can become disabled, develop a chronic illness, retire, pass away, or simply leave. Most companies use their cash to grow their business and not to fund contingent business liabilities. Kai-Zen helps provide the funding needed to protect your business in a wider variety of circumstances. Kai-Zen is a superior way to informally fund Non-Qualified Deferred Compensation. By financing a life insurance policy as opposed to traditional investment alternatives, your client gets the added advantage of additional cash through the use of leverage, potential tax-deferred growth, protection benefits should something happen to the employee all without downside market risk. Surrender charges may reduce the policy’s cash value in early years. It is possible that coverage will expire when either no premiums are paid following the initial premium, or subsequent premiums are insufficient to continue coverage. The Tri-Zen Strategy is dependent on the employer making contributions for the first 5 years and not defaulting on the policy, which could result in policy lapse and surrender charges. The employee will not have access to the policy, the cash values, the death benefits or the living benefits until the loan is repaid and the assignment is released. The lender has the right to discontinue funding new premiums, exit the market, or to demand loan repayment based on the terms and conditions signed by the Master Trust. See the Master Trust documents for additional information. Receipt of accelerated benefits may be taxable and may affect eligibility for public assistance programs. This information is not intended as tax advice. Please consult with your tax advisor regarding your own situation. Not all riders are available by all life insurance companies. This concept is not much different than financing a house – your client uses a mortgage to leverage the assets they have on hand to buy more house than they could afford on their own. Money is borrowed to buy more house, or with Kai-Zen, more benefits. With Kai-Zen they are buying a life insurance policy with a larger death benefit, more living benefit protections, and the potential for more cash accumulation without the risk of losses (due to declines in a market index). As noted from the chart, the addition of bank funding gives your client the potential to significantly enhance the funds available for benefits.